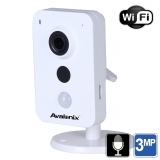 Security Cameras with Audio either have a built-in microphone on the camera or an audio-input connector to connect an add-on microphone. 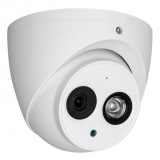 Regardless of whether the mic is built-in or external, security camera microphones are sensitive enough to pickup sounds from a 40ft radius when in a quiet room. 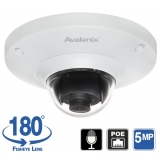 Although results vary based on ambient noise, these security cameras are a great way to record both video and audio. 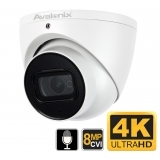 Choosing a camera for your security camera system depends on whether you need an analog camera, HDCVI camera, or IP camera. 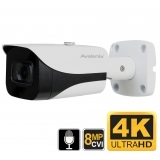 Surveillance cameras with built-in microphones allow the easiest connection to a security video recorder. 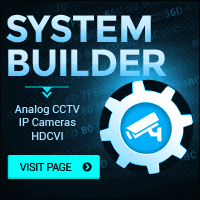 HDCVI cameras don't need a cable with an audio connector; the audio signal is combined with the video signal. You simply need a HD Siamese Cable or a roll of RG59 Coax. 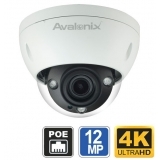 For IP cameras with audio, the audio/video/power signals are carried over one network cable. For analog cameras we recommend using our 50ft Audio Video Power Cables or 150ft Audio Video Power Cables that make camera cable installation simple since the cable contains connectors for audio, video, and DC power. For cameras with optional external microphone inputs, you will need a microphone, a RCA coupler to attach the mic to the camera, and a 12VDC power supply to provide power to the mic next to the camera. 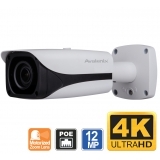 For HDCVI and network IP cameras with external audio inputs, once the mic is connected to the camera, audio is combined with the video signal and sent over the cable back to the HDCVI DVR or NVR, respectively.